Wow! Is this USA Today, or is this HuffPo? Not often do I mistake those two, but this piece at USA Today is nothing more than a collection anti-cop rhetoric quoting disproven lies, interspersed with quotes from far left, hardly legitimate sources, in an attempt to legitimize illegal, irresponsible behavior of people who are old enough to know and act better. If you have been paying the slightest attention as of late, if you’ve actually bothered learning the facts of the overwhelming majority of the incidents the left keeps throwing out when they scream “police brutality,” the decision to run this anti-cop propaganda by a major “news” outlet should bother you. The following quotation is how it opens. “The image of an unarmed person of color being brutalized by police has become inescapable. In other words folks, he is doctor shopping, because no one has given him the diagnosis he wants. No one “seeks a diagnosis” morons, you seek help from a doctor who diagnoses your issue, if you have one. In this case, my professional diagnosis of this guy is that he is lacking anything resembling a spine. Hell, according to the author, when Valdez drives past a memorial for Sandra Bland (a woman who committed suicide while in custody) it causes him severe anxiety. The piece continues on, jumping around in an attempt at outlining all the reasons that cops and their use of force (to arrest people who are not complying) are to blame for, well, everything. Let me address all the issues brought forth in the following two paragraphs and point to where, in my opinion, the problem really lies. In the first paragraph, the police are keeping you safe, unless you are a criminal. There are very few incidents that have hit the news in the last several years where the police were indeed “the bad guys.” I can only think of a few cases of unjustified use of deadly force (Walter Scott and Charles Kinsey come to mind), and even in those cases, ONLY ONE person who was shot by the cops was an actual innocent man (Charles Kinsey). All of the other legally unjustified shootings, which I freely admit there were some, but in every single other case, the person shot or injured was in fact a criminal who was actively resisting arrest. In fact, most of the incidents that everyone constantly points to, it was the” bad guy” (ie: criminal) who got injured by the good guys (cops), and in nearly all of those cases, the force used was legally justified. The problem is that too many people in society are siding with the criminals, not the victims or the neighborhoods. As for the second paragraph, there are too many logical fallacies to address as a group, so I will break each sentence down individually. I would partially agree, and that is indeed the problem. People are empathizing with criminals based on their skin color, while completely disregarding the criminal behavior that lead to the police contact. This contact is a cause and effect relationship, but the cause is most definitely not the skin color of the person being contacted, it is their illegal behavior. You cannot logically discuss the results of the contact while completely ignoring the very reason for the contact. It does not work that way. Valdez’s family did not do him any favors, and in fact the lessons they taught him likely lead to his arrest. Had they taught him to be polite and respectful, I doubt he would have ever been in his situation to begin with. That is because the empathy you are talking about is empathy for violent felons! You are an “out-group” not because of your skin color but because of who you choose to support. 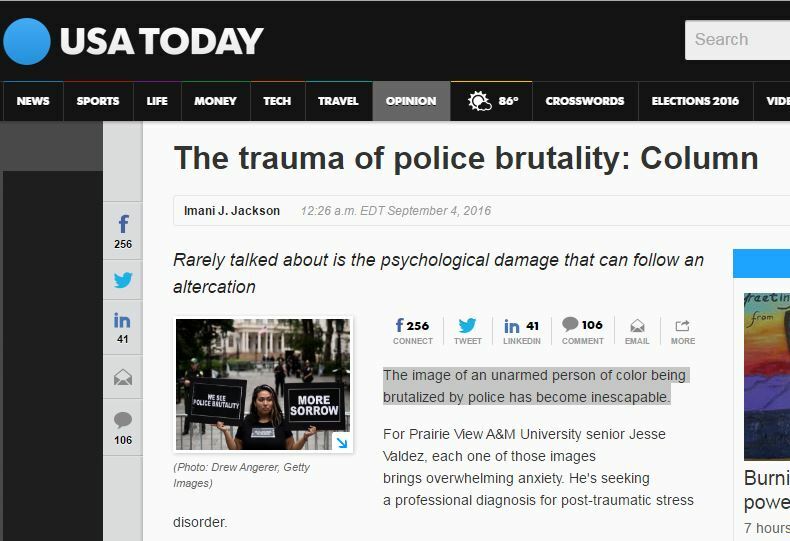 The author then continues with the “oh those horrible cops” whine fest and says that people can get PTSD from just watching videos online of “police violence.” This is really getting out of hand. That is an activity that they personally, willingly chose to subject themselves to. No one sat them down and forced them to watch, yet you want to say they got PTSD from that? Hell, I probably have PTSD from playing too much Call of Duty. I mean really, have you seen how good the graphics are? And in that game, I get killed. Me, personally, dead. Over and over. It is traumatizing. I have constant nightmares about it. I am reliving it over and over. And yes, that was dripping with sarcasm. Do you see how stupid that sounds? But it is the same exact argument they are using about the videos. Really? 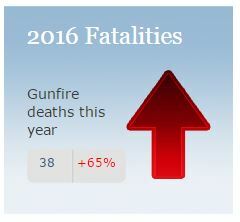 Would you also care to address the huge spike in officer deaths due to gunfire in 2016? Last I checked, this year was holding at a 65% increase compared to last year, and this year in particular has had a number of coordinated, extremely violent ambushes on cops. But of course you do not want to talk about that. That is great, a raw number taken totally out of context. That definitely proves, nothing. How many of those 700 people were innocent folks doing nothing, vs. how many of them were violent criminals in the act of committing a violent crime? Yes, context matters. FACTS MATTER! Here are some sad facts about police and minority communities. You want to know why cops are “harassing” minorities more than whites, here is why. More minorities live in low income and ghetto neighborhoods than whites. Crime occurs more in low income and ghetto neighborhoods than it does in higher income or suburban neighborhoods. More crime is committed by blacks and other minorities than is committed by whites (this fact has NOTHING to do with skin color, or any of the BS that racists use to justify their dislike of another ethnicity – it is strictly a socio-economic issue). Cops spend more time where crime occurs than where it does not. If cops are spending more time where minorities live, and minorities commit a higher proportion of the crime, it only follows that cops will interact with minorities on a more frequent basis. It is really not rocket science. Really? Think Progress? At this point, I’m waiting for the author to quote Cop Block. Let me be perfectly frank, this is most definitely NOT a “public health issue” just like “gun violence” is not a public health issue. Why is the left so emphatically trying to make everything somehow a medical issue? You know what this is? This is yet another example of the left trying to make everything into someone else’s fault. They are driving a societal wide total lack of personal responsibility. Nothing is your fault; it is always something someone else did. Got pulled over and got a speeding ticket? 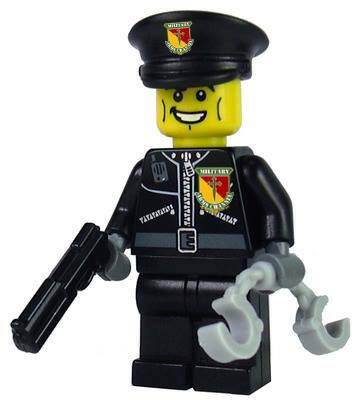 Cop’s fault! It was a speed trap, and he was probably rude. Got twisted up and/or slammed to the ground while being detained by the cops? It is totally the cops fault; your actions did not necessitate such “police violence.” Had they only asked you in a nicer tone, 15 more times, you would have finally complied, probably. Folks, this is like trying to have a “rational conversation about police use of force” with a five year old kid, who is an only child, while he is all hopped up on sugar, and caffeine, and in desperate need of a nap. There is absolutely NOTHING rational about that conversation. When one side (the left) refuses to admit even the slightest amount of culpability, you absolutely CANNOT have an adult discussion. Speaking of a rational discussion, here is a video in which Bill Whittle dismantles the majority of the arguments that are at the root of that entire USA Today article. Take a few minutes, watch it, and learn something. How has America turned into such a whiny, crying wuss in such a short period of time? A couple hundred years ago, some pissed off colonials took on the most powerful nation on the planet at the time, and won our independence. Seventy years ago, our nation came to the aid of the rest of the world and freed most of Europe and the Pacific. Fifteen years ago, after our country was attacked by foreign terrorists, we went overseas and chased their America-hating butts into caves underground and did our damnedest to eradicate them. Ten years ago, race relations in this country were far better than they are now. Today, adults need safe spaces on college campuses to protect them from words, men want to be able to use the women’s bathroom, Black Lies Matter has convinced America that it is racist again, and people apparently get PTSD from watching a video where a cop has to use force to arrest a criminal. Holy crap America, wake up! While you are at it, toughen up too!